Rationale: Bronchoscopic lung volume reduction utilizing shape-memory nitinol endobronchial coils (EBC) may be safer and more effective in severely hyperinflated homogeneous emphysema compared to medical therapy or lung volume reduction surgery (LVRS). Methods: The effect of bilateral EBC in patients with homogeneous emphysema on spirometry, lung volumes and survival was compared to patients with homogeneous emphysema randomized in the National Emphysema Treatment Trial (NETT) to LVRS or medical therapy. NETT participants were selected to match EBC participants in age, baseline spirometry, and gender. Outcomes were compared from baseline, at 6 and 12 months. Results: There were no significant baseline differences in gender in the EBC, NETT-LVRS or medical treatment patients. 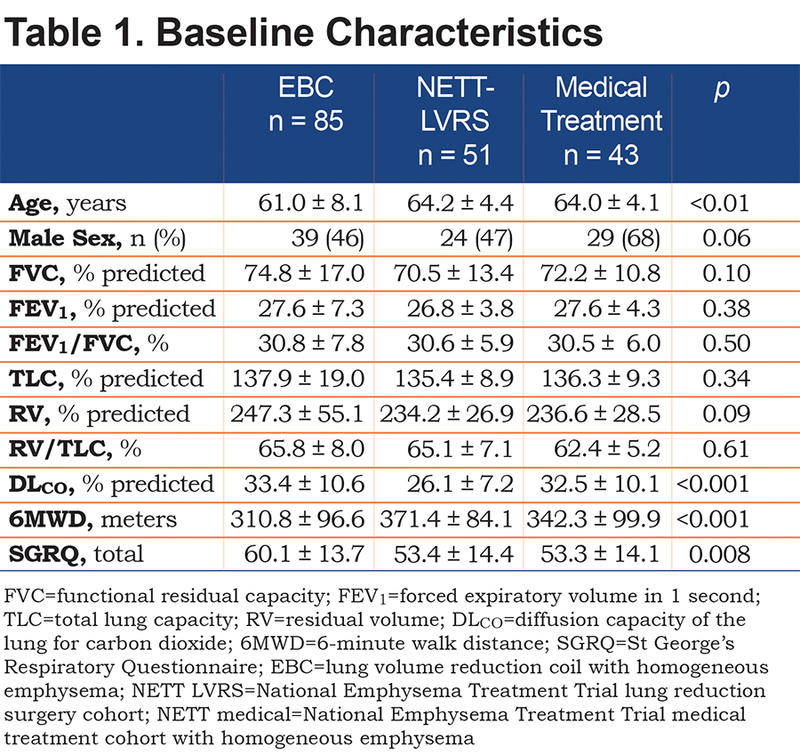 At baseline no differences existed between EBC and NETT-LVRS patients in forced expiratory volume in 1 second ( FEV1) or total lung capacity (TLC) %-predicted; residual volume (RV) and diffusing capacity of the lung for carbon monoxide (DLco) %-predicted were higher in the EBC group compared to NETT-LVRS (p < 0.001). Compared to the medical treatment group, EBC produced greater improvements in FEV1 and RV but not TLC at 6 months. FEV1 and RV in the EBC group remained significantly improved at 12-months compared to the medical treatment group. 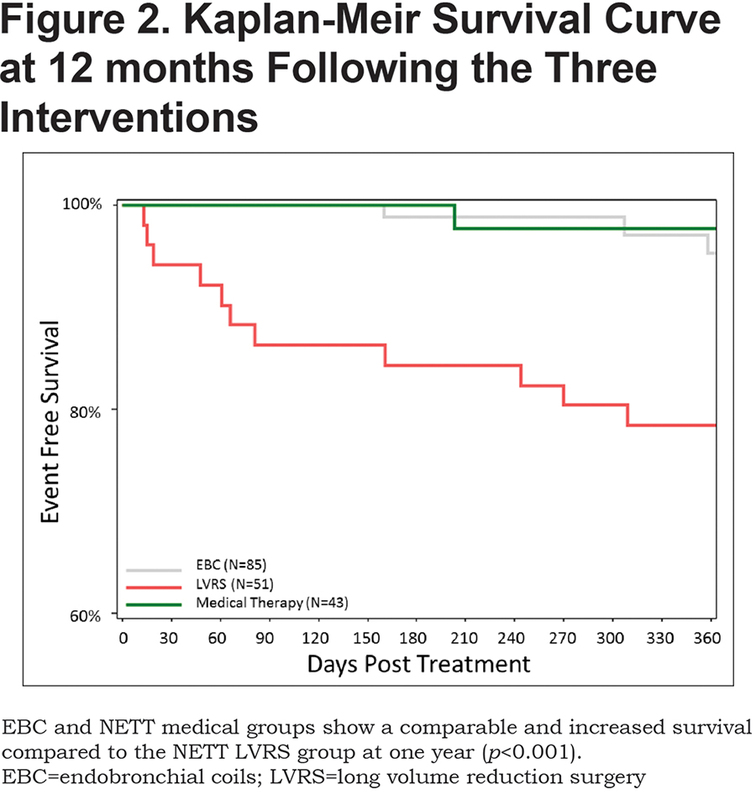 While all 3 therapies improved quality of life, survival at 12 months with EBC or medical therapy was greater than NETT-LVRS. Conclusion: EBC may be a potential therapeutic option in patients with severe homogeneous emphysema and hyperinflation who are already receiving optimal medical treatment. We hypothesized that bronchoscopic lung volume reduction utilizing EBC would be more effective than usual medical care in severely hyperinflated emphysema patients, with fewer complications compared to LVRS. If a single lung was homogenous the patient was considered to have homogenous emphysema. Changes in post bronchodilator spirometry, lung volumes and survival in EBC patients at 12 months post procedure were the primary outcomes compared to the NETT medical therapy or NETT-LVRS arms. Data is reported as mean ± standard deviation (Mean ± SD) unless otherwise indicated. Data was analyzed by analysis of variance (ANOVA) to determine statistical significance. Least mean squares using ANOVA with factors of treatment and baseline values was used in the final determination of statistical significance. A p<0.05 was considered statistically significant. Survival analysis was conducted using a Kaplan-Meier analysis. Data were comprehensively analyzed for 179 patients (85, EBC; 51, NETT-LVRS; 43, medical treatment) as shown in Table 1. NETT-LVRS and medical treatment patients were slightly older compared to EBC patients (p<0.01). Baseline lung function was similar in all 3 groups except diffusion capacity was lower in the NETT-LVRS group compared to the EBC or medical treatment groups (p<0.001). 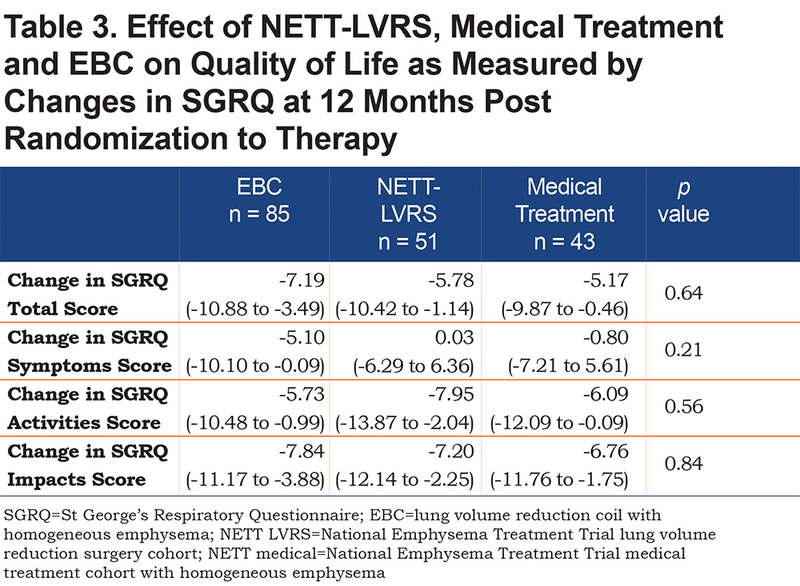 Baseline 6MWD was highest in the NETT-LVRS group compared to the EBC and medical treatment groups (p<0.001) and baseline quality of life was worse in the EBC compared to the NETT-LVRS or medical treatment groups (p=0.008). 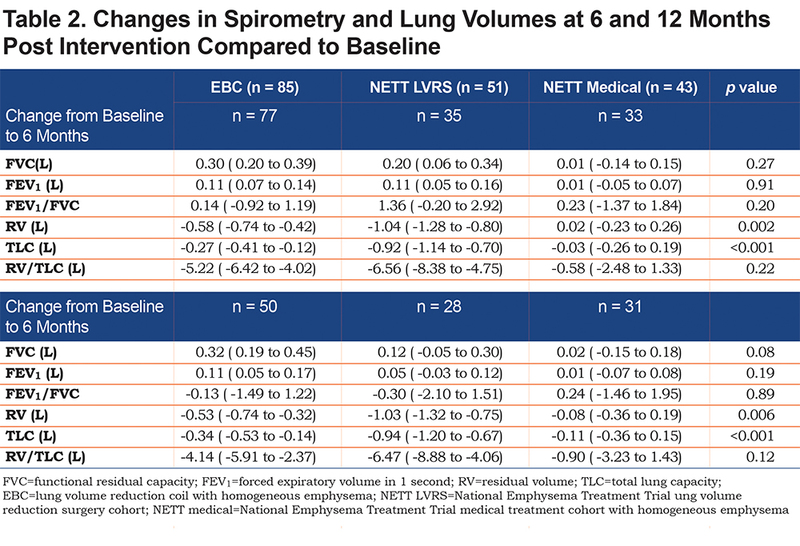 Table 2 shows changes in pulmonary function measures in patients at 6 and 12 months post intervention compared to baseline in the EBC, NETT-LVRS and medical treatment groups. As shown, there was no significant difference in changes in forced vital capacity (FVC), forced expiratory volume in 1 second (FEV1) and FEV1/FVC between groups. There was a trend toward a higher FVC in the EBC group at 12 months (p = 0.08). At 6-months there was a significant decrease in residual volume (RV, p=0.002) and total lung capacity (TLC, p<0.001) in both the EBC and NETT-LVRS groups compared to medical therapy. The magnitude of the decline in RV and TLC was greater in NETT-LVRS than EBC. At 12 months there remained a significant decline in RV (p=0.006) and TLC (p<0.001) compared to baseline in both the EBC and NETT-LVRS groups compared to medical therapy alone. Following treatment with EBC, the 6MWD improvement was greater in comparison to the NETT-LVRS or medical treatment groups at 6 (p<0.001) and 12 months (p=0.001, Figure 1). In all 3 groups, SGRQ total and its subcomponent scores of symptoms, activities, and impacts decreased greater than what is considered the minimal clinically important difference (MCID) evidencing an improved quality of life at 12 months compared to baseline (Table 3). Although not statistically significant, the mean reduction in total SGRQ was greatest following EBC at 12 months when compared to the other groups. Figure 2 shows a Kaplan-Meir survival curve at 12 months following the 3 interventions. EBC and medical treatment groups both showed an increased survival compared to the NETT-LVRS group at 1 year (p < 0.001). Our results demonstrate that placement of endobronchial coils in patients with advanced homogeneous emphysema reduced residual volume, total lung capacity, and increased 6MWD compared to optimal medical therapy. Additionally, placement of endobronchial coils improved 6MWD and survival compared to LVRS. These data suggest that placement of lung coils that reduce end-expiratory lung volume may be a potential therapeutic option in patients with advanced homogeneous emphysema and hyperinflation who are already receiving optimal medical treatment. Initial studies examining the impact of endobronchial coils to improve outcomes in severe emphysema have shown benefit in patients with both heterogeneous and homogenous emphysema. Benefits have included improvements in lung function, 6MWD and quality of life with lung coil placement compared to usual care.17,20,23,24 However, these were non-controlled studies. Shah et al showed substantial improvement in exercise capacity and quality of life at 3 months compared to medical treatment with coil placement in a small randomized, controlled study that included both heterogeneous and homogeneous emphysema patients.22 Two larger randomized, controlled studies comparing EBC to medical therapy were recently completed in which approximately two-thirds of the population in each study had severe homogenous emphysema.18,21 Overall, coil treatment showed modest improvements in 6MWD, FEV1 and lung volumes compared to medical therapy.18,21 Our findings offer further support that EBC may benefit patients with homogeneous emphysema for whom few other options are available. A recent controlled trial using one-way endobronchial valves demonstrated modest improvements in FEV1, quality of life and 6MWD in patients with homogeneous disease.32 In previously published lung reduction trials using bronchoscopic techniques designed to reduce lung volume by atelectasis (endobronchial one-way valves) or fibrosis (lung sclerosant or vapor), patients with very heterogeneous disease had a stronger response than those with less heterogeneous or homogenous disease.33-35 This is logical since removal of hyperinflated, diseased regions in heterogeneous patients allows more preserved lung tissue to re-expand, while removal of marginally viable lung in homogenous patients may result in expansion of similarly diseased tissue and overall worse functional status. 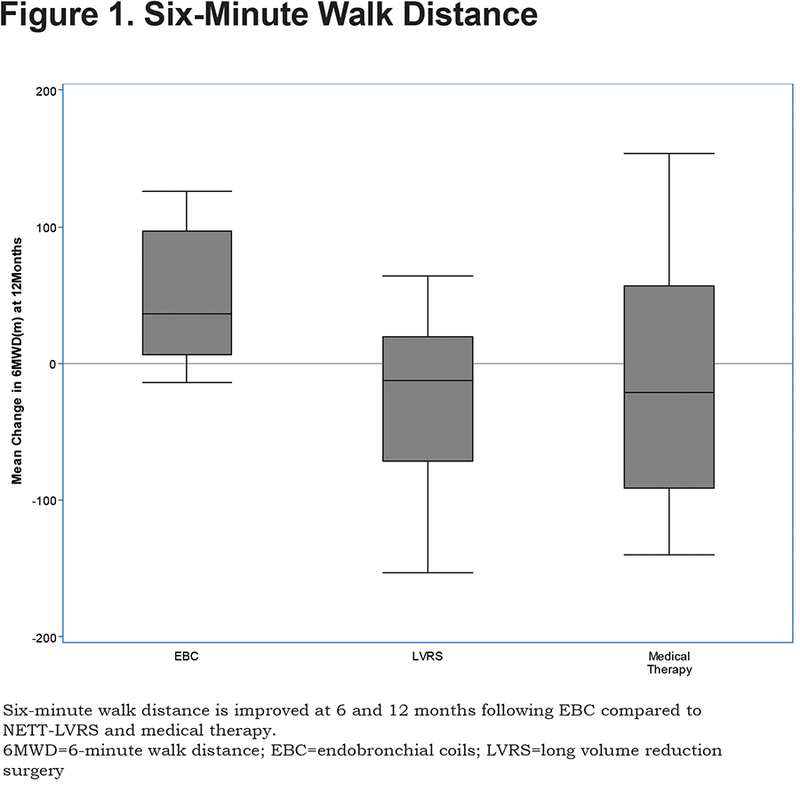 Accordingly, our study shows that patients undergoing EBC had less reduction in residual volume compared to those who underwent LVRS, although 6MWD and survival was improved. Several factors may account for this seemingly disparate outcome between less volume decrease but greater improvements in 6MWD and improved survival. Although LVRS is a more potent lung reduction approach, its increased cardiorespiratory morbidity and mortality outweighs its therapeutic benefit in patients with severe homogeneous emphysema. The post LVRS period is complicated by the need for prolonged acute hospitalization and subacute care secondary to cardiorespiratory complications hallmarked by the ubiquitous presence of air leaks, pneumonia, cardiac arrhythmias, and respiratory failure that may negatively impact 6MWD performance.13,15 In contrast, homogeneous patients with severe emphysema who undergo EBC suffer from fewer and less severe cardiorespiratory complications allowing patients to improve their functional status post intervention. In addition, EBC may improve 6MWD by enhancing cardiac performance as a result of decreased hyperinflation. Recent data show the impact of hyperinflation on impairing cardiac function.36-39 Similar beneficial cardiovascular effects of LVRS have been demonstrated by others.40-44 Furthermore, lung volume reduction improves chest wall asynchrony and oxygen uptake kinetics.45,46 These physiologic benefits in aggregate may contribute to the improvement in 6MWD distance as well as survival that we report in the EBC cohort. Our study is limited because of its retrospective design, and comparison of patients who underwent coil implantation in studies separate from patients who underwent optimal medical treatment and lung volume reduction surgery in the NETT. Although we carefully matched individuals based on their lung function and degree of hyperinflation, there were differences in age, diffusion capacity and gender that we could not control. Additionally, the NETT was conducted from 1998 to 2003. Changes in medical treatment have occurred since NETT compared to the era of the coil implantation studies that have only been recently conducted. Another limitation is that participants did not have standardized care pre and post procedure due to the retrospective nature of the study and difference in available medical therapy. However, a strength of our study is that we compared data that was prospectively collected in prior well-conducted studies in a patient group that requires novel therapies because of their high morbidity and mortality. In summary, our data suggest that lung volume reduction via lung coil implantation may be a better alternative than LVRS to improve outcomes in patients with severe hyperinflation and homogeneous emphysema. Future prospective investigation is warranted. Author contributions: NM, FCS, GJC contributed to the study's conception and design. NM, TK, DC, FJH, PLS, DS, CD, SB, SHB, MP, FS, CW, GD, WG, MH, RK, SL, JH, FCS, GJC contributed to data acquisition/analyses and interpretation. NM, DC, FJH, PLS, DS, CD, FCS, GJC contributed to the writing and substantial revisions of manuscript. Authors NM, TK, DC, CD, SB, MP, FS, CW, SL and JH have nothing to disclose. FJH reports personal fees from Pulmonx, Uptake, BTG, and Olympus outside the submitted work. PLS reports personal fees from Broncus, Creo Medical, Holairia, Olympus, Medtronic and PneumRX/BTG as consultant on a scientific advisory board and also reports other support: a sponsorship to Imperial College for a bronchoscopy course by from ERBE, Cook medical, Medtronic, Boston Scientific, Aquilant, Broncus, Pulmonx, Olympus, & PneumRX outside the submitted work. DS reports grants, personal fees, non-financial support and other from PneumRx/BTG; grants, personal fees, non-financial support and other from Holaira, Inc; grants, personal fees, non-financial support and other from CSA Medical; and grants, personal fees, non-financial support and other from PulmonX Inc., outside the submitted work. SHB reports support from PneumRx during the conduct of the study. GD reports personal fees from BTG/pneumRx during the conduct of the study. MH reports personal fees from BTG during the conduct of the study. RK reports grants from Pulmonx, PneumoRx, and Boston Scientific during the conduct of the study. FCS reports grants and personal fees from PneumRx, and grants from PulmonX and Spiration outside the submitted work. GJC reports grants from Boehringer- Ingelheim, Novartis Astra Zeneca, Respironics, MedImmune, Actelion, Forest, Pearl Ikaria, Aeris, PneumRx, and Pulmonx and other support from HGE Health Care Solutions, Inc, Amirall, Boehringer- Ingelheim, and Holaira, outside the submitted work.